At the End of Big Omaha 2010, Tony Hsieh, of Zappos, pulled an Oprah move and gave the entire audience his new book Delivering Happiness. His presentation was outstanding. Tony connected the business cornerstones of customer service and company culture with life’s pursuit of happiness. The results were very interesting and quite profound. The first 50 or so pages detail Tony’s entrepreneurial spirit as a youth. From building a worm farm and operating a pizza joint to selling Link Exchange for 265 Million. Here, the Zappos CEO is still searching for his higher purpose. Following is a transition period that takes place over the next 40 pages. Tony begins to reflect and understand when he is happy the most - when sharing experiences with friends. He goes out of his way to recreate this environment and also starts his own VC firm. From pages 90-130, we see Tony integrate into Zappos as the young company struggles with funding to survive. 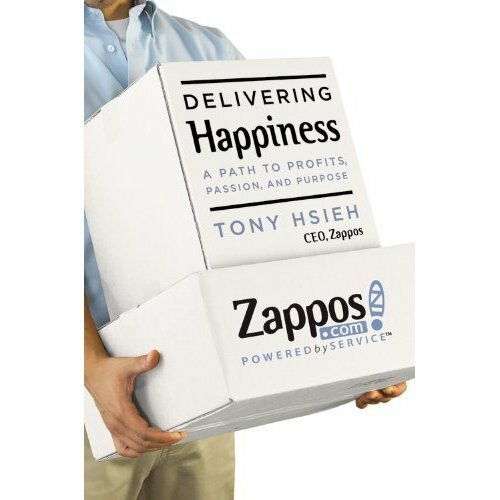 For the next 100 pages, we see the Zappos culture crystallize as Tony applies his thoughts on happiness to the company core values. The young CEO connects the dots leading to over 1 billion annual sales in 2008. This section is the “Meat and Potatos” of the book sprinkled with Zappos excerpts. In the final 10 or so pages, Tony writes about the similarities of happiness from both personal and business levels. He helps his readers find their goal in life and outlines three types of happiness: Pleasure, Passion, and Higher Purpose. This section is very insightful and worth the price alone. Delivering Happinessis a very light and easy read. However, it’s not a fast and furious like Rework. The book could have been about 80 pages shorter. Some parts were very boring and redundant. Mainly, the actual Zappos excerpts and the anecdotes from employees. They were overkill. I didn’t need a lot of personal examples because Tony was very clear about the Zappos’ culture and core values. One of those values being “Do more with less. WOW them. Wow your customers. Give them such exceptional service that it stands out. For repeat customers, Zappos will upgrade the shipping class to overnight. Since they are located right next to a UPS hub, the customers can receive their items in less than 12 hours (sometimes eight!). Now that’s WOW. Be humble. Be a servant-type leader. Your job as management is to get your employees functioning on all four cylinders and then get out of the way. By facilitating communication, you allow the people on the front lines to improve the company from the bottom-up. Develop your company to follow a higher purpose. Zappos’ purpose is to Deliver Happiness to their customers, employees, and vendors. The result is more returning customers, more productive and creative employees, and great vendor relationships. Tony and the Zappos forefathers have done something unique here. They’ve built a company that delivers happiness. This book is a must read for anyone building their own company, involved in customer service, or who just wants to attain happiness. It’s also great for a behind-the-scenes look at the stepping stones a billion dollar company takes as it comes into its own. In the vein of Mindspread, we will be giving away 4 copies of this book. If you are one of the first four people to comment on a core value and how that value has aided you personally/professionally, Reflect7 will send you a copy of Delivering Happiness. To Recap:\ 1) Be one of the first four to comment.\ 2) Post your own core value.\ 3) You must promise that after you’ve finished reading the book, you’ll give it to someone else.\ 4) You must not have ever met me personally.\ 5) Send me an email to brian at reflect7 dot com with your name and mailing address (US Only) and a link to your comment. 1 book left as of 4:26pm on June 10th.